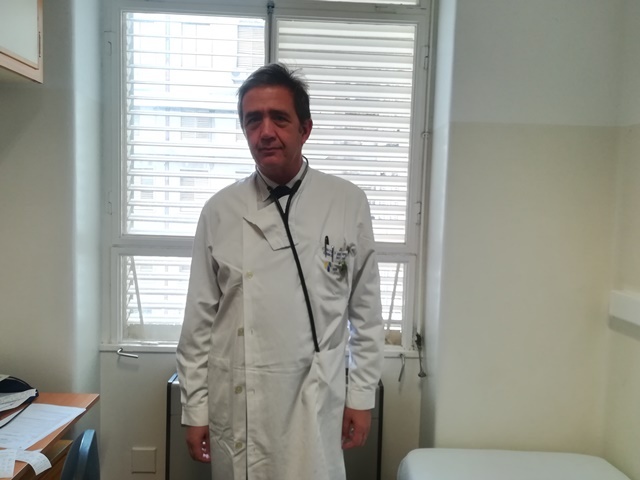 His name is Luís Rosário, and he is a Cardiologist at the Coronary Intensive Care Unit, one of the pioneer units worldwide, which belongs to the Santa Maria Hospital. In this unit, they treat critically ill patients with cardiovascular problems who are hospitalised, requiring intensive care, continuous monitoring and 24-hour treatment. These treatments can involve the administration of antibiotics, some intravenous, and control arrhythmias, cardiac insufficiencies, or the application of devices that temporarily support organs that fail. In a joint, collaborative work with other areas of Cardiology, the UTIC often needs to resort to Surgery or Arithmology. ICU patients are hospitalised for several days and often have a close connection with families, with whom they speak to assess the direction of treatment. He lives close to the Santa Maria Hospital and gets to work very early, always on foot. At 8:30 a.m., the various Cardiology teams are already meeting to discuss the diverse clinical cases that they have before them, nevertheless, he says that there are no routines in the life of a doctor because every day is different from the previous. But because the knowledge acquired is outdated within a few years, new studies and more methods are always required of the doctor, “knowledge is outdated by about 50% in five years.” Perhaps the incessant search for the new in the professional life justifies the incessant search for the adrenaline that, too, needs to be transposed to the personal plane. The reasons for Luís Rosário being a doctor today were his parents, when after a trip to the United States they decided to offer Luis a small first aid case. It was from the union of an Engineer and a Mathematics teacher that the doctor was born, but Cardiology only came to arouse his interest later, by responsibility of the course. “In addition to studying a little,” he had time to visit the Quarteto or Londres cinemas, famous halls that have already disappeared. He did not miss the films of the season, but his cinematographic passion was based on the films of Antonioni, Dreyer or Kurosawa and by other less commercial authors, signature mark of the Quarteto cinema. With an active role in the Students’ Association, despite being a year that was not yet ideologically marked, he discovered that team spirit and mutual support were also strengthened through Rugby, and he played until the end of the course, in the University championship. In order to participate in the National Championship, he joined the Rugby team of Técnico until the end of the course, the year in which the Técnico team won the Portuguese Cup. Little did Luis Rosário know that he would come back to the Instituto Superior Técnico much later, and now with a work project. Time passed, and he went to the United States where he lived for a year and a half. It was after returning home that he did his PhD and grew as a doctor in the private sector. But he decided that “he had to make time,” and the connections to the past and origin reminded him again of the friendship of some of the people he kept from the course, linking them again to sport. From having his feet grounded by Rugby, he went with the wind to defy the sea. He sails even today and maintains his respect for the sea, but he does not fear it. And so, he participates in winter and summer competitions, in national competitions and in world events when they happen nearby. The more we complain about bad weather and the wind, the more of an ally it is to Luís Rosário who runs to the sea, even at the risk of falling into it and getting hypothermia, as it happened a long time ago. Students may not believe that coronary heart disease has increased in recent years, although more and more people are able to stop it in time and more effectively. To avoid the statistic that is set before us, the prevention that currently exists is not enough, nor the intervention that activates by its hands, and it is here that his connection to the Técnico returns to remind Luís Rosário of the old days in which they wore the sweaters to go and play on the same team. Currently, he teaches at the Instituto Superior Técnico, in Biomedical Engineering, in the co-regency of Instrumentation and Amplification of Signals, focussing on the study of devices that can help to monitor cardiac patients. But in parallel and in an attempt to go beyond what meets the eye, he has a research program within the framework of the CAML with a bifurcation, “one that intends to develop and improve the devices that can be adapted to heart patients, outpatients, or critically ill patients”. The other is rooted in the times of a scholarship granted by Gulbenkian, with a post-doctorate study on the preservation of cardiac stem cells. At this time, he seeks to give them a clinical application and this implies synergies with cellular and molecular biology. “I hope that through these cells we can regenerate the heart, multiplying the heart cells and resident cells; then there are also cells that, as circulating as they are, can help restore heart functions”. This research can soon be transferred to the new Reynaldo dos Santos building, and if at the start “the first results of the experiments were not as miraculous as the expectation”, the future shows that only now are the first steps being taken, but new clues have emerged that may bring new insights. For now, the focus is on resolving heart attacks, or heart failure. “The best forms of administration are still being analysed, to see the need for complete therapies and at the same time to identify the clinical profiles that benefit most from these same treatments”. Luís Rosário says that all students should have their mentor and that when they keep their mentors in memory they sometimes hear them and use them as azimuth when making decisions. In spite of all the established guidelines and experience that time develops, one of the things he has learned is that “from the moment we become internal, the first thing we should have is fear, and be careful of the enthusiasm that we will be capable of doing everything, whether in diagnostic or therapeutic decisions. We have to be very consequential because we are going to cause changes in people’s bodies. At meetings in the morning we study the cases, it is not only our duty to see whether the patient is part of the clinical study group, or if it is a specific case, because otherwise we would simply have artificial intelligence to solve problems”. Experience is acquired along the way and is always far from being complete, he explains to me in an exercise that does not pretend to be humble, but only evident. “I’m always scared when someone says they have a lot of experience, I remember right away the phrase from Mae West that said that experience is what men say they have, when they are no longer able to do things. This means that only when we reach a high level of experience will we no longer have the opportunity to apply it”. Doctor and experienced Professor, or not, as he would defend, our interview was interrupted punctually at the time he had agreed to speak to the family of one of his patients. I stood confused amid the rhythmic whistle of machines that seemed to tell me that there was too much life, or perhaps very little. When he returned, I asked if he could take a photograph that showed who he is. Without poses and without vanity he stopped at a window, in fact it seemed to me that it was indifferent to him whether the photograph was good, he was in a hurry. He clearly has other concerns and time is urgent, for sick people are is constant priority. And there are those who have not yet reached his hands and whom he hopes to help before they do, if his investigations are fruitful.